6/20/18 venue, Amsoil Arena: "Some Trump supporters lined up for hours in advance of the rally. Above, 6/20/18, Duluth, Minn. Trump rally, screen shot from pscp.tv, attendee with evil "Buy American, Hire American sign"
"President Donald Trump hailed the impact of his deregulatory policies and steel tariffs Wednesday, and predicted he would win Minnesota when he runs for re-election in two years. 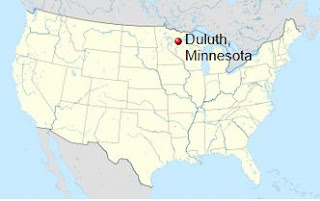 "I hate to bring this up, but we came this close to winning the state of Minnesota," Trump said to a crowd of thousands of cheering supporters at an evening rally in Duluth's Amsoil Arena. "And in two and a half years, it's going to be really, really easy, I think." In the hourlong, campaign-style rally and at an earlier roundtable discussion with elected officials and union workers at the Port of Duluth-Superior, Trump said Minnesota's mining industry has benefited from his regulatory cuts. "It was crazy what was happening, you couldn't do anything," Trump said at the roundtable, of the previous regulatory environment. "You know about it from the mining industries, and all of the different work you've had stopped, and it now is going forward. So much work is going forward in Minnesota and in so many other states." At the rally, Trump threw his support behind copper-nickel mining in Superior National Forest, to huge cheers from the audience. He frequently returned to the political stakes for Republicans in the upcoming midterm elections, in which the party will try to hold its congressional majorities. He repeatedly plugged the congressional campaign of Republican Pete Stauber, who is trying to wrest northeastern Minnesota's Eighth Congressional District from Democrats. "He is a great guy, he loves you and he loves this country, and he's doing fantastically. We're going to win so much," Trump said of Stauber. The sprawling Eighth District stretches from Duluth to the Arrowhead, across the Iron Range and south to the Brainerd Lakes area and exurban areas north of the Twin Cities. It is widely viewed as one of the key battlegrounds in the national fight for control of the U.S. House. Trump won the Eighth District by nearly 16 percentage points in 2016, though he narrowly lost the state to Hillary Clinton. While Trump occasionally returned to issues pertinent to Minnesota, he also ranged widely across numerous topics. He spent a few minutes talking about immigration, just hours after he signed an executive order that his administration said would halt the harshly criticized practice of separating children from their immigrant parents as they cross the U.S. southern border. "We're going to keep families together, but the border is going to be just as tough as it's been," Trump said. Trump touched on other favorite topics. He called the news media dishonest several times, talked up the nation's low unemployment numbers and rising wages, praised Congress for increasing military spending in the recently passed federal budget and touted his recent moves to increase tariffs on goods from China. He spent a few minutes on his recent summit with North Korean leader Kim Jong Un, characterizing it as an unqualified success. "Chairman Kim will turn that country into a great, successful country," Trump said. Some Trump supporters lined up for hours in advance of the rally. The arena reached a capacity crowd in excess of 8,000 people, according to authorities, with many hundreds more turned away. Inside the arena, the crowd was dotted with hundreds of red "Make America Great Again" caps. "I'm very excited to see him in person. It shows he represents us," said Gary Nystrom, 54, of Staples. Nystrom said he had never voted in his life until he turned out for Trump in 2016. Barbara Greenland, a Trump supporter from Perham, said the president has faced unfair criticism for the border policy. "He needs to stand his ground," said Greenland, 69. "We have to take care of our own kids." At the Port of Duluth-Superior roundtable, the discussion centered on the economy. It was the latest in a series of similar roundtable events he has held across the country in recent months. In March, Trump announced a plan to impose a 25 percent tariff on imported steel and 10 percent tariff on aluminum. On the Iron Range, where much of the economy has been built on mining iron — which is used to produce steel — many workers welcomed the tariffs. The Range has seen mining jobs decline in recent years as U.S. manufacturers struggled to compete with cheap steel imports. The roundtable and rally mark the first time a sitting president has stopped in Duluth since President George W. Bush visited in 2004, and it was Trump's first rally as president in a state he did not win in 2016. U.S. Reps. Tom Emmer and Jason Lewis, who are running for re-election this year, were at the roundtable and rally; they were joined at the latter by state Sen. Karin Housley, who is running for U.S. Senate. U.S. Rep. Erik Paulsen did not attend. Gubernatorial hopeful and [pathetically weak Establishment embarrassment to all Americans] former Gov. Tim Pawlenty also did not attend, but his running mate, Lt. Gov. Michelle Fischbach, was there. Jeff Johnson, who got the Republican Party's endorsement and will face Pawlenty in the August primary, was on hand. Trump did not publicly express a preference between Pawlenty and Johnson. Partway through his speech, Trump offered a tribute to Minnesota and the Midwest — another signal that the region is in his sights politically. "Your great state was pioneered by men and women who braved winters to make better lives for their families," Trump said. "They all had one thing in common: They loved their families and their country and they loved their God. Together we're renewing the miracle of the great American Midwest."" I was there tonight in Duluth, MN at the Trump rally. I drove 2 hours to get there, stood in long lines for three and a half hours and by the grace of God and good luck, I was part of the last group who were granted entrance into Amsoil Arena. The turnout for Trump was massive, at least 20,000 people in total and standing outside. Trump supporters were everywhere hoping to get in and see the President of the United States: in the parking lots, in all levels of the adjacent parking garages, on the sidewalks and overhead skyways, waiting in the old DECC buildings, a turnout so huge, yet so peaceful, so we’ll behaved even though many knew the arena couldn’t hold everyone. The evening started about fifteen minutes late. The place was actually quiet and filled with very nice people. People in wheelchairs, people with severe disabilities, African Americans, Native Americans, people from neighboring Wisconsin, people from the Iron Range communities, young people who are very, very pro-Trump. Believe me the scene was amazing and electric. When Trump was finally announced, the crowd went nuts! Tonight was my first Trump rally. The experience was truly fantastic and foretelling. Republicans will be coming out to vote in big numbers in November because they want to help Trump! The people who drove for hours and stood in line for hours on end love Donald Trump. The media cannot separate Trump from his base. I felt like I was a part of history in the making tonight in Duluth." I was there also...It was a three hour drive and a four hour wait in line in a crowded skywalk. There was an electric outage in the area (coincident – or something else?) and the skywalk was extremely hot. Yet everyone waited it out, sweat pouring from head to toe and I didn’t hear anyone complain. I think Minnesota turned red hot today. what an experience!!!"